Although single port laparoscopic surgery (SPLS)-experienced surgeons have been shown to perform better than inexperienced surgeons on simulated SPLS, the rate of acquisition of this skill is not known. 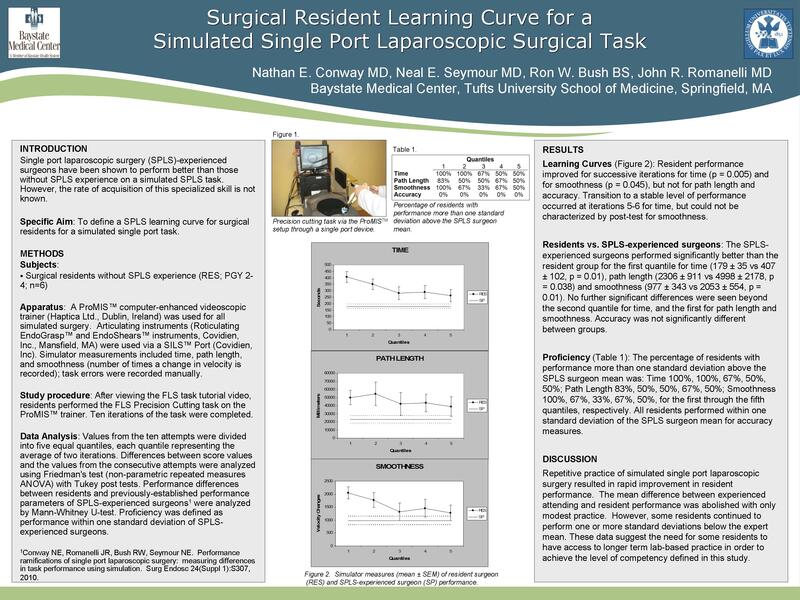 To define a SPLS learning curve for surgical residents, a simulated single port task was performed repetitively and performance compared to SPLS-experienced surgeons. Study participants were six PGY 2-4 residents in the surgery residency at Baystate Medical Center in Springfield, MA. Residents performed 10 iterations of the FLS Precision Cutting task on the ProMIS™ trainer (Haptica Ltd.) using Roticulating EndoGrasp™ and Roticulating EndoShears™ instruments (Covidien, Inc., Mansfield, MA) placed via a SILS™ Port (Covidien, Inc). Simulator measurements included time (seconds), path length (cm), and smoothness (number of velocity changes); task accuracy (cm² off cutting line) was recorded manually. Values from the ten attempts were divided into five equal quantiles, each quantile representing the average of two iterations. Differences between values from the consecutive attempts were analyzed using the Friedman test with post-tests. A flat segment of the learning curve was defined by the point at which the value of successive iterations was not significantly different from values of previous iterations. Performance differences between residents and SPLS-experienced surgeons were analyzed by Mann-Whitney U-test. Proficiency was defined as performance within one standard deviation of SPLS-experienced surgeons. Learning curves: Resident performance improved for successive iterations for time (p = 0.005) and for smoothness (p = 0.045), but not for path length and accuracy. Transition to a stable level of performance occurred at iterations 5-6 for time, but could not be characterized by post-test for smoothness. Residents vs. SPLS-experienced surgeons: The SPLS-experienced surgeons performed significantly better than the resident group for the first quantile for time (179 ± 35 vs 407 ± 102, p = 0.01), path length (2306 ± 911 vs 4998 ± 2178, p = 0.038) and smoothness (977 ± 343 vs 2053 ± 554, p = 0.01). No further significant differences were seen beyond the second quantile for time, and the first for path length and smoothness. Accuracy was not significantly different between groups. Proficiency: The percentage of residents with performance more than one standard deviation above the SPLS surgeon mean was: Time 100%, 100%, 67%, 50%, 50%; Path Length 83%, 50%, 50%, 67%, 50%; Smoothness 100%, 67%, 33%, 67%, 50%, for the first through the fifth quantiles, respectively. All residents performed within one standard deviation of the SPLS surgeon mean for accuracy measures. Repetitive practice of simulated single port laparoscopic surgery significantly improves performance. The characteristics of a learning curve for this task trainer were best demonstrated for time as a performance measure. In aggregate, significant differences in resident and attending performance were abolished with only modest practice, but several residents continued to perform 1 or more standard deviations off the expert mean. This indicates that some residents will require more than 10 attempts to achieve the level of competency defined in this study.